THE SIGNATURE(s) ON THIS ITEM IS PRE-PRINTED, This means it is a COPY of an original signature, NOT the original. The overall size of the item is aprox 12 x 10 inches. The item is a mounted copy photo. Ready to frame. 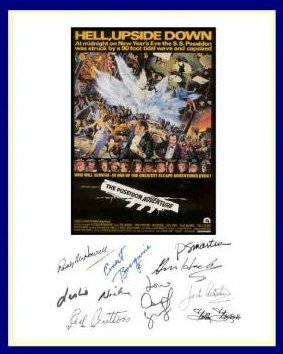 Photo signed by RODDY MCDOWELL, ERNEST BORGNINE, PAMELA SUE MARTIN, LESLIE NEILSON, GENE HACKMAN, RED BUTTONS, STELLA STEVENS, JACK ALBERTSON and CAROL LYNLEY. This is an excellent opportunity for any fan of the person or person featured. This is a glossy photo as shown containing This Item makes a super gift, and is ideal for framing and displaying.